Touchpad firm Synaptics is looking to get into the gaming market by offering new touch and fingerprint-sensing technologies for mice and keyboards. At least week's GDC in San Francisco, the company presented its Natural ID fingerprint scanning technology. 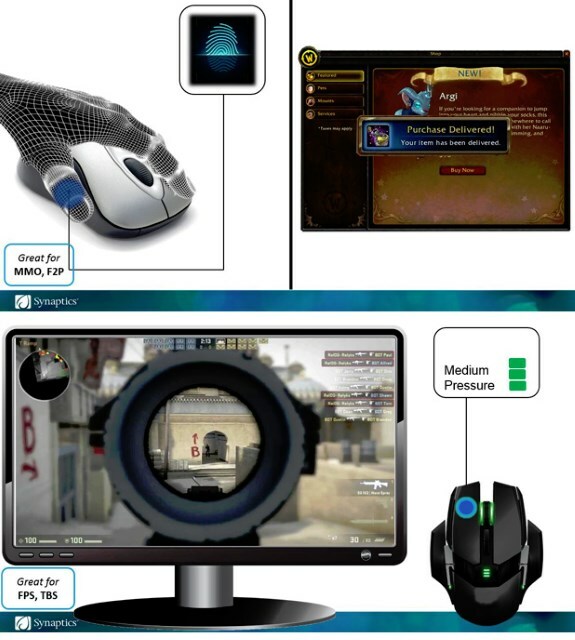 Designed to be integrated into a mouse button, this technology could be used for biometric authentication in MMOs or to authenticate in-game purchases without a separate password. In a game like Counter-Strike: Global Offensive, this pressure sensitivity might be used to bring up a weapon's scope with a light touch. A heavier press might trigger the weapon's maximum magnification. As with the fingerprint sensor, this technology could be useful outside of games, too. I'd love to be able to control brush sizes in Photoshop by varying the pressure on the left mouse button. For gaming keyboards the firm demonstrated capacitive touch sensors for the keyboard's space bar, these sensors can enable actions like zooming and panning around a RTS map by rubbing your thumb over the space bar. Synaptics showed some interesting concepts at the GDC but unfortunately the firm didn't announce any design wins so it remains unclear when these technologies may make it to market.